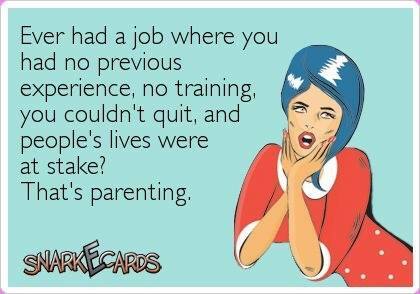 EVER HAD A JOB WHERE YOU HAD NO PRECIOUS EXPERIENCE, NO TRAI - ProudMummy.com the Web's Community for Mums. EVER HAD A JOB WHERE YOU HAD NO PRECIOUS EXPERIENCE, NO TRAINING, YOU COULDN'T QUIT, AND PEOPLE'S LIVES WERE AT STAKE? THAT'S PARENTING.